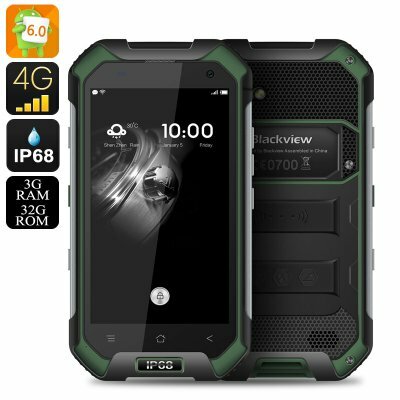 Successfully Added HK Warehouse Blackview BV6000 Android 7.0 Smartphone - IP68, Dual SIM 4G, 2GHz 8 Core CPU, 3GB RAM, NFC, OTG, 13MP Cam (Green) to your Shopping Cart. The Blackview BV6000 brings a stellar performance in a tough and ready rugged exterior. Boasting an octa core MT6755 chipset with 3GB of RAM under the hood it has a high end performance that's sure to earn it a solid fan base. The BV6000 is an updated to last years BV5000 and boasts some considerable updates, not least of which is the performance. A 2.0 GHZ octa core CPU alongside 3GB of RAM delivers a lightening quick performance that can handle games, movies and multitasking with ease. The BV6000 has a 4.7 inch screen, is more than enough games and videos with its HD resolution. This screen size is optimized to bring you all you need without becoming unwieldy and bulky but with the BV6000 size isn't an issue. Running on the Android 7.0 operating systems bring the phone some nifty refinements including a better deign and shortcuts as well as an optimized battery control for improved endurance. this new intuitive GUI makes using the phone effortless and more enjoyable than ever before. This BV6000 phone is built around a metal case and protected by Gorilla Glass 3 and an IP68 rating ensuring a high level of durability and protection from water and dirt ingress. With rubberized corners it can withstand knocks and drops thaw would spell the end to lesser devices making the BV6000 a phone that's ready to take on any adventures with you. An atmospheric pressure sensor offers accurate weather forecasts brining helpful updates to anyone who is spending time outdoors and with GPS support this compact Smartphone offers plenty of help to hunters, fishermen, adventures and anyone else who works or enjoys an outdoor lifestyle. Connecting to the 4G network brings speedy internet connections that allow you to stream HD footage right to the phone and keeps you connected when on the go. There are two SIM card slots so you dont have tom mess swapping out cards and can even orgnise work and personal contacts with easy. NFC functions means that the BV6000 is ready for your e-wallet with Android pay and additionally features such as OTG and SOS support are also included. A massive 4200mAh battery lets you enjoy a full day of usage without needing to recharge and impressive cameras will capture all you adventures in full HD video. This Rugged Android 7.0 Smartphone comes with a 12 months warranty, brought to you by the leader in electronic devices as well as wholesale Rugged Smartphones..